Bas relief busts of Sir Henry Parkes and Sir Edmund Barton commemorate the centenary of Federation. Sir Edmund Barton, GCMG KC (18 January 1849 – 7 January 1920) was an Australian politician and judge. Barton was a Member of Parliament and active in the Federation Movement in New South Wales. He was Prime Minister of Australia from 1901 to 1903. He was knighted in 1902 and a Justice of the High Court of Australia from 1903 until his death in 1920. Barton moved to Manly in 1891. First Prime Minister of Australia. 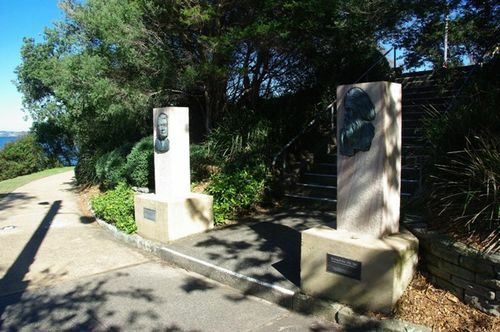 This is a project by Manly Council to commemorate the 2001 Centenary of Federation.